My interest in comic books started just over three years ago. Little did I know then that comic books weren’t just a sequence of squares with “Pow!” and “Bam!” written in pointy speech bubbles. This stuff is science! All you have to do is listen to the introduction to William Kuskin’s on-line course, “Comic Books and Graphic Novels,” to realize there is a method and skill to making a comic book. One of the most fascinating aspects of comic book science is the use of real estate – there’s very little! There are an endless number of theories and philosophies on how to make it work. Characters, worlds, events, alliances, arcs, conflicts, secrets, intrigue – they all have to be skillfully crafted into twenty pages or less. The writing must be sharp and efficient and the pictures literally need to be worth a thousand words. Two artists who do this very well are Paul Azaceta and Elizabeth Breitweiser, artist and colorist (respectively) for Outcast by Image Comics. 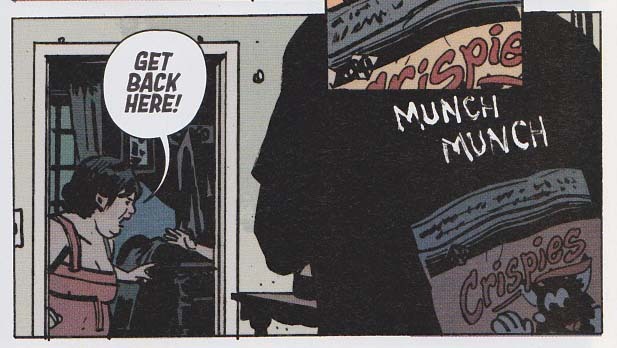 Outcast is a horror story about Kyle Barnes whose family inexplicably attracts demons and how it has made Kyle a victim and community outcast. From the opening page of issue 1 the artists let you know something isn’t right. It’s night time (panel 1) and we’re in the middle of a family argument, but this doesn’t seem to be why things feel wrong. In the foreground of panel 2 is the little brother who’s not involved with in the argument, but he’s the largest image and focal point of the frame. Why? 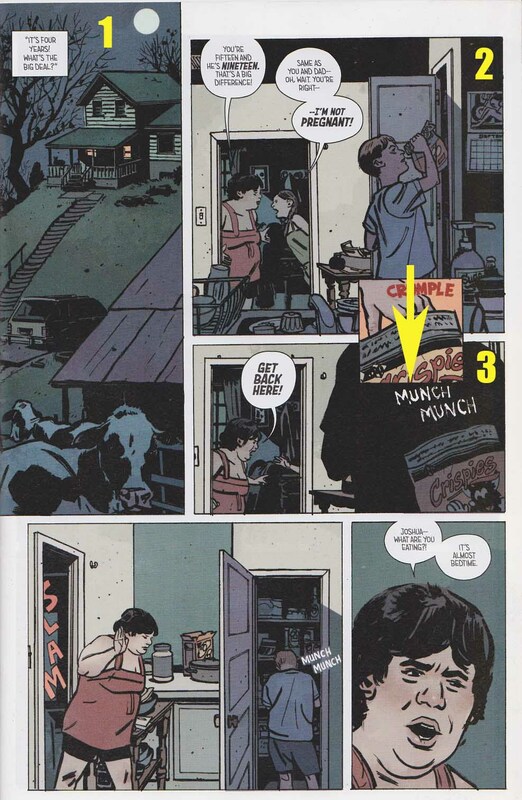 A small square inset of the potato chips bag not only tells you where to go next but also what the focal point is in the next panel–again it’s the boy. We’re zoomed in closer but that just makes the silhouette of the boy even bigger. In fact in every frame the boy is in shadow. Finally in the last frame on the page, the mother’s attention shifts to the boy and is saying exactly what the reader is thinking, “What are you doing?” This last frame is not by chance. The suspense is built. Before the mother (and we) can find out what’s going on, we have to turn the page for the big reveal. In this panel, Kyle is being attacked by a demon-possessed boy. Note the perspective from which the artist chooses to show us the scene. It’s as if the reader is on their knees at eye-level with the altercation but near Kyle’s feet, just out of reach of intervening. Even the word, “WHUDD” runs off the page showing how the violence is actually happening at the farthest point in the panel away from us. Color, tone, texture, and value can be used to communicate mood. In this panel the brighter colors of a mother watching her daughter play outside are contrasted to the dark, unkempt world of Kyle, the father. The heavy black outlines and color palette still prove these scenes are from the same universe although from different perspectives. In the call-out image, Kyle is facing the direction of the mother and daughter but he’s looking down. The whole composition shows Kyle is not in his family’s life and how it affects him. 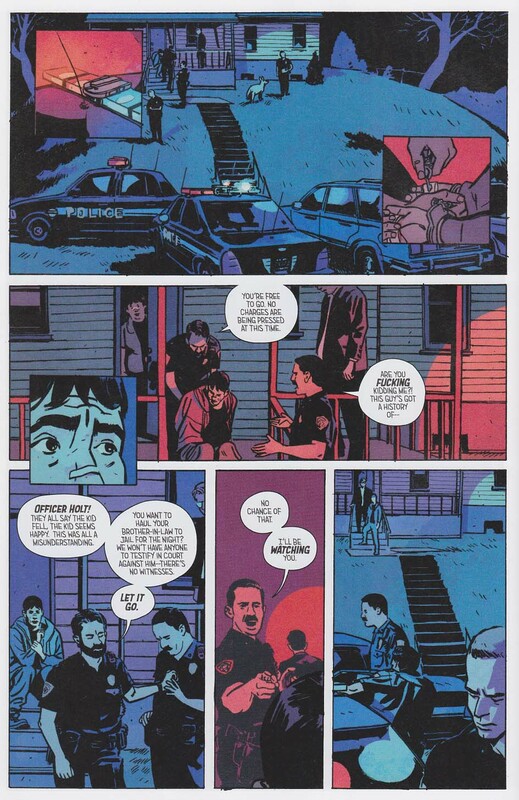 In this 1-page scene, the violence of Kyle freeing the demon-possessed boy is over and the police have shown up to sort things out. The only action on the page is an officer pointing, yelling and then walking to his car. Almost everything else is static – sitting, standing, watching. Why does the scene seem so tense? Blues and reds juxtaposed to each other create an illusion of conflict and energy. Even with nothing going on in the picture, it’s tense. Notice how the scene with the cop yelling is red and the panels to the left and right are blue. Red and blue are also used to identify which side of the story the characters fall. Notice in the middle panel red and blue are used to divide the two worlds: one with demons and one without, one Kyle has to live in and the one he is exiled from. The best part of this page is the mom. In the middle panel she is now in the blue shadow of the door. 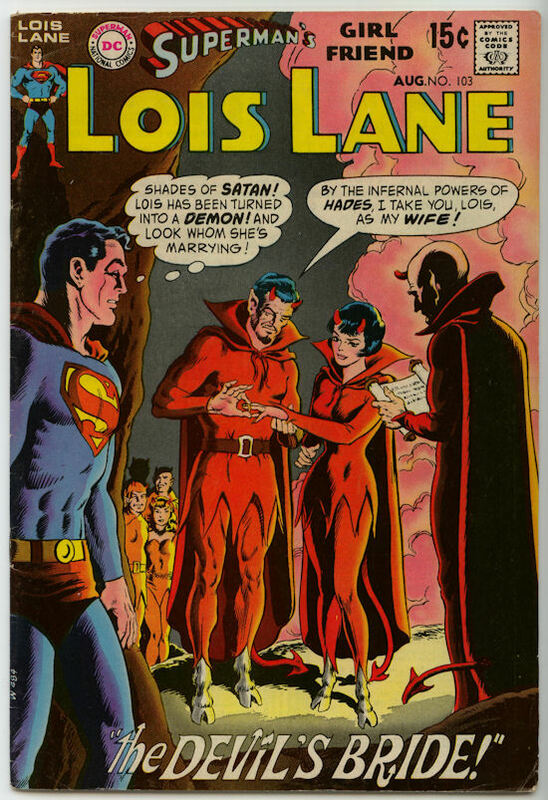 Her world has dramatically changed from page one where she’s wearing a red top and standing in the light. Pull out a comic book you have a home. Pick one of the categories above. How does the artist use it to tell the story? Can you identify a different mechanic used to tell the story? 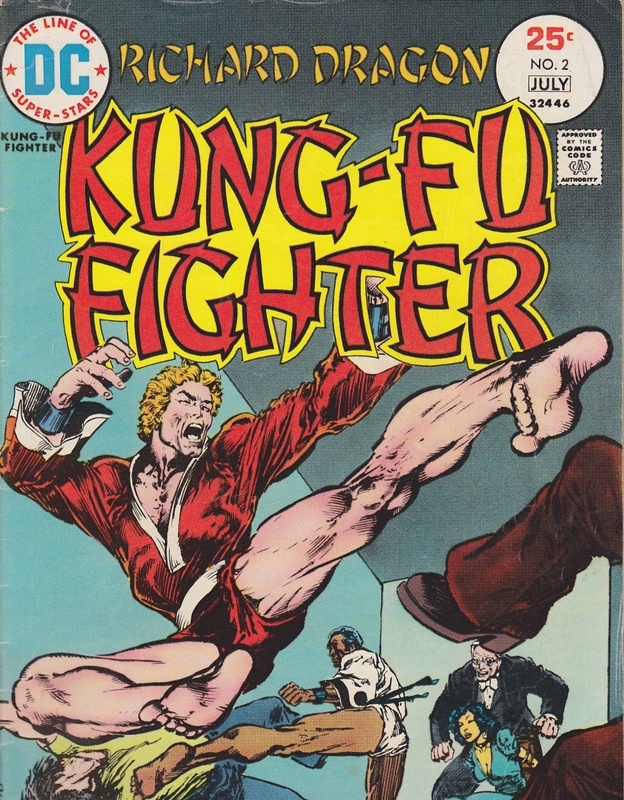 How different do you think modern comics are executed compared to the golden (1930s to 50s), silver (1956 to 70s), or bronze (1970s to 1985) ages of comics? Are they better or worse?